This exclusive cottage accommodates up to 5 guests comfortably. 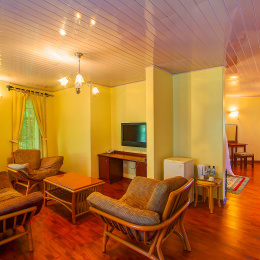 The family cottages offer the best experience at an affordable price. Be served with experienced waiters, get to eat quality food prepared by our best cooks. Our cottages have mosquito nets, fridge, safe deposit box, hot shower. This cottage is fitted with hair dryers and has a spacious lobby. All our cottages are spacious with their own manicured compound. There is also access to internet and tv channels via satellite pay TV. Amid large well-maintained gardens with stunning, beautiful and romantic artisan’s lawns, Poa Place Resort offers an ideal Kenyan experience at an affordable price. Come and be served by our experienced waiters, enjoy our quality meals prepared by our chefs, and sleep in one of our luxury cottages. The cottages are spacious and within their own manicured compound. Amenities in each unit include mosquito nets, a fridge, a safe-deposit box, hair dryers and relaxing hot showers.